Burnley’s ‘safety first’ rhetoric has served them well over the years and, despite this season’s outstanding success in the Premier League, the goalposts haven’t shifted for chairman Mike Garlick. 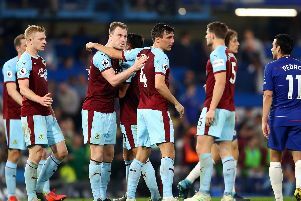 Whether it happens at the weekend, or whether the Clarets have to wait until the final day, the club will be playing Europa League football next season having finished as the ‘best of the rest’ in the top flight. But, even with the prospect of European football at Turf Moor for the first time in more than 50 years, Garlick insists that hitting 40 points and securing football at this level for another term, all while running the club’s business prudently, will remain the key objective. He said: “I didn’t even think about it [Europe]. I thought about 40 points, safety, and another season in the Premier League. “To be honest, next season, while Europe is fantastic, our first target will be 40 points again. That’s the first priority because safety comes first, it has to. Garlick, just like boss Sean Dyche, is a realist and although the Clarets are enjoying unprecedented glory in this modern era of the game, he understands that there’s always another metaphorical mountain to climb. “It’s been 30 years of a generally upward curve, but there’s been a few downward bits in it as well, quite a few and some fairly big ones over the years,” he said. In preparation for the next challenge, the juggling of four separate competitions, Garlick implied that the board will continue to back March’s Manager of the Month Dyche in the transfer market. The powers that be have always been supportive financially, with the club’s transfer record broken on numerous occasions for the likes of Andre Gray, Steven Defour, Jeff Hendrick, Robbie Brady and striker Chris Wood, and nothing will change this time around when Dyche looks to strengthen his squad over the summer. “There’s no change there because every year we’ve been in the Premier League we try and strengthen and we always try and end up stronger at the end of the window than we were at the beginning of the window,” Garlick said. “That won’t change this summer. “He [Sean Dyche] is unbelievable, what he’s done and the loyalty he’s shown to the club, the motivation he gives to the players, everything about the guy is fantastic.